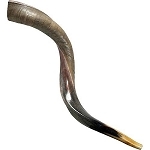 The striking appearance of this classic Kosher Shofar is the result of its naturally attractive markings and wonderful wavy shape. Any important Jewish event, especially the High Holidays, is enhanced by this great-sounding Shofar. Size: 116-121 cm / 46-48 inch.